The MKC can be equipped with the available 285-horsepower 2.3L GTDI turbocharged engine that also delivers 305 lb.-ft. of torque. Power is delivered by three brilliant technologies — turbocharging, direct injection and twin independent variable camshaft timing (Ti-VCT). The 2.3L engine empowers MKC to offer a towing capacity of 3,000 lbs. when properly equipped. The steering wheel is wrapped in available hand-stitched Wollsdorf leather, hailing from the Alpine region of central Europe. It flawlessly complements the exquisite craftsmanship and luxurious comfort of the MKC interior. EPAS is an important component of Lincoln Drive Control. It provides an easy, fluid steering feel at low speeds and a firmer, more controlled feel at higher speeds. And that’s not all. It also constantly adapts to changing road conditions and compensates for surface irregularities. 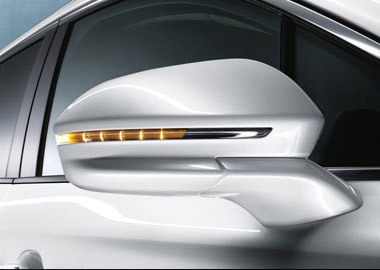 The 2017 MKC features available auto-fold power mirrors. These mirrors will fold in when the vehicle is locked and unfold once you’re inside and the door is closed. There is also a switch on the driver’s door that folds the mirrors toward the vehicle to help avoid hitting an object while you’re parking. Signature LED accents frame the high-intensity discharge (HID) headlamps, which in turn accentuate the split-wing grille. HID headlamps also last longer and use less energy than conventional halogen bulbs. Connect to your MKC remotely using the available MyLincoln Mobile app. The available embedded modem in the vehicle communicates with the smartphone app and allows you to start, lock, unlock and locate your vehicle from virtually anywhere in the world. You can even set up a scheduled remote start. In the app, set your MKC to start, up to five to 10 minutes before you leave, and your car will be ready for you. 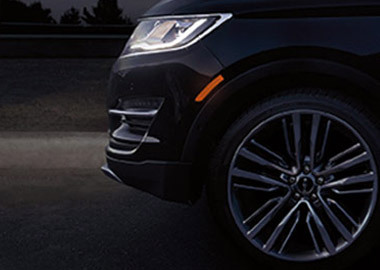 Intelligent Access with push-button start is standard in Lincoln MKC. With the key fob in your pocket, purse or briefcase, just open the driver’s door. Once inside, press the brake pedal and then the start button, shift into gear and go. It’s so easy and convenient, you’ll wonder how you ever got along without it. The enhanced available THX® II Certified Audio System features a range of innovations in sound technology from the acoustical minds at THX. It puts out 700 watts of power and features 14 strategically placed speakers—including three two-way front slot speakers, two individual rear-door tweeters to precisely reproduce your music’s high notes, and two three-inch D-pillar-mounted speakers to envelop MKC passengers in a truly immersive sound experience. And innovations such as distributed bass technology help ensure that low notes are being evenly dispersed throughout the cabin. The available Navigation System includes a six-year prepaid SiriusXM Traffic and Travel Link trial subscription that offers detailed traffic and weather information, gas station locations and fuel prices, sports scores and schedules, and movie theater locations with show listings and times. Available driver-activated adaptive cruise control (ACC) operates just like normal cruise control, with one exception: Its sensors can detect traffic slowing ahead and automatically slow your car to maintain the preset distance you’ve set. When traffic has cleared, your car resumes the set speed. Forward collision warning with brake support, included with ACC, can alert you if it senses a potential collision with the car in front of you. A heads-up display, which simulates brake lights, flashes on the windshield. If you don’t react immediately, the brakes will precharge and increase brake-assist sensitivity to provide full responsiveness when you do brake. Available BLIS® (Blind Spot Information System) with cross-traffic alert helps warn you of vehicles you might otherwise miss. BLIS uses radar in the rear quarter panels to identify a vehicle entering your blind spot and alerts you with an indicator light in the sideview mirror. Cross-traffic alert also uses radar to detect vehicles approaching from either side when you’re slowly backing out of a parking spot or your driveway. If it detects a vehicle approaching from up to 15 yards away, it sends an audible warning, a visual display in the sideview mirror and a signal in the message center.